Congratulations!! You’ve started a new company, and now you’re ready to hit the rooftops screaming and sharing your love. Love for your product, love for your company, love for the mission and values you’re about to carry out. Love. First stop, Facebook: because that’s where people go when they have good news and want to tell as many people as possible. 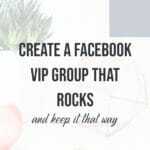 Then, it’s time to create your Facebook VIP Group and add all your–. For the love of all that is nonspammy stop before you add even one person to your group. You want a Rockin‘ group, right? You want a group that people want to check. Where they love your every post and can’t wait to see your new inventory, offerings, and courses. Right? Then before you move any further with building your group, read this. Are you enjoying this article? Take a minute to pin it. You never know when you might need to come back and review these tips! Let’s talk for a minute about what people like to do on Facebook. Most people signed up for Facebook with one thought in mind: to make it easier to talk to friends and family, especially friends and family that live further away from them. When they join groups, they join so they can connect with friends and family and make new friends over a common interest. See that? Common. Interest. You know what is not a common interest? Don’t get me wrong. Your friends and family love you and they want you to succeed. Even the ones who don’t seem all that supportive or who think you made a mistake because “you need a real job” love you and ultimately want to see you successful and happy. But that’s not the same as sharing an interest in your business with you. In fact, in many cases when someone seems less than supportive of your new business endeavor, it’s because they are dwelling on the very real fear that you will either use their friendship or place your business above their friendship. By blindly adding your friends to your new group, you just proved them right. Even without meaning to, and even with the best of intentions, you’ve still proven that you care more about your business than you do about your friendship. Because a friend invites people to places, they don’t just kidnap them and bring them somewhere without even asking. Here’s the secret: recreating the in-person experience is your best ticket to a successful group. What this means is if you want your group to work for you — provide leads, attract new clients, and grow your client base so you can make more money — then you’ve got to stop thinking of it as an offline group of people and start thinking of how you would treat those people if they were standing right in front of you. 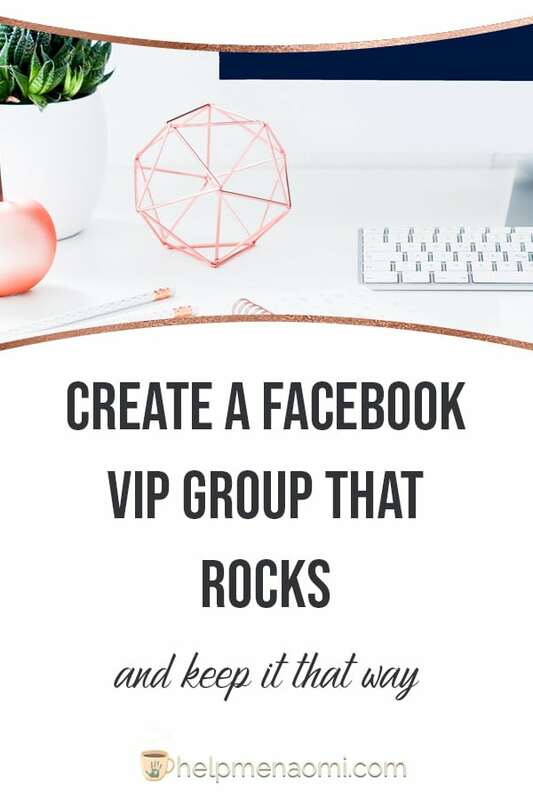 Invite the people to your group just as you would invite them to your house. And while they’re there, treat them just as if they were important guests in your home. Because guess what, they are. Invite them in, make sure they are comfortable, and talk to them like they are your friends, not your customers. 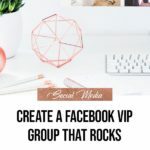 Despite how much it hurts your group, it’s still a popular idea to hold giveaways and incentives to get people added to your group. You see, we get it in our heads that large groups will automatically translate into higher sales. Statistically speaking, the more people who see your specials, the more will buy them. And so the giveaways starts. And wow, do some groups get huge doing that! No wonder it’s so popular. But it doesn’t work like this in groups — larger does not necessarily mean better. Especially on a platform like Facebook that is actively trying to promote genuine engagement and connection between brands and clients. Go back to the concept of recreating the in-person experience with these people. Remember the time when your friend dragged you over to someone else’s house and you didn’t know anyone else there? How awkward did that make you feel? Did you really have any idea about what was going on? The only difference is that if this happens on Facebook, you may not necessarily notice right away. About 10% of all people never see the notification from Facebook that they have been added to a new group. Well, that’s no good, is it? What good is having someone in your group if they don’t even know they’re in there? For the remaining 90% who do notice right away, more than half of them, 55%, are instantly turned off. Now they’re mad at you for having the group they got added to, and they’re mad at their friend for disrespecting them and adding them to a group without their permission. So more than half of the people that just got added are going to turn around and leave and probably block anyone from ever adding them again. Well, that’s no good either, is it? Because now there are countless people who might have actually been interested in your group who will never give it a chance because they got added so someone else could win a prize. The rest of the people who get added and notice right away, totaling 35% of all the people added, also notice the prize that got them there. And so they stick around for more prizes. If you post something with a giveaway right away, they’ll play along because they want to win. But after a while, even they will lose interest, especially if they never win anything (which is the only reason they stuck around). So what you end up with is a huge group of people, but only a very small percentage of them have any real connection with you. The rest of them are only interested in free stuff (your fault — you trained them to be) or don’t even know they are in there. The first two are obvious. If something goes on sale, post it. If you decide to run a giveaway, post it. But the second two are where you want to focus the majority of your attention. In fact, you want about 80% of your posts to fall within numbers 3 and 4. So what do your people want to learn? Mostly, they want to learn about your services — but not from a sales point of view. They can read all the reviews and the descriptions without being in your group. What they really want to learn about is how to use your services to make their life better. And how they can be even happier. If you sell food or kitchen products, they want recipes. If you sell makeup, they want tutorials on different looks. If you sell handbags, they want to learn how to keep them clean or how to transfer their stuff from one handbag to another. Posts that will give your members a purpose for buying from you. And as far as having fun, that is all about your personality and getting to know your people better. Games, memes, polls: get your members talking and they will have fun. Especially if you can get them talking about themselves. Have them share pictures of their dogs, their kids, their cats, their silly selfies. It doesn’t matter if it’s related to your business or not, it they’re having fun, they will keep checking your group because they will want to see what you’re going to do next. The biggest problem with having a large group of people in which only a few participate in anything is that with a lower than normal engagement rate, even the people who want to see your posts may not be able to see them. It’s all part of Facebook’s algorithms on how to prioritize the posts that show up in a person’s newsfeed. If you have 100 people in your group, and 25 of them regularly comment or like your posts, that’s a 25% engagement rate: Facebook will be trained to think that people in your group like your content and want to see more and therefore it will continue to show your content in their newsfeeds. This happens regardless if they have their notifications for your group turned on or not. Now, if your same group suddenly grows to 300 people, but the same 25 people continue liking and commenting on your posts (because the rest of them don’t know they’re there, aren’t interested in buying, or are only there for your giveaways) now your engagement rate is down to 8.3%. You’re no longer important. And with such a low engagement rate, Facebook will learn that people don’t want your group to be prioritized anymore. Which means your posts will be shown less often. Giving your 25 people fewer chances to like or comment… You see the spiral that could happen from this? If your same 25 people stop liking and commenting on your posts because they can’t see them anymore, your engagement rate continues to go down, making it harder and harder for anyone to see your posts. 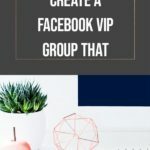 What if you already added people to your group? While it’s not a good practice to add people to your group, it’s not an insurmountable problem. 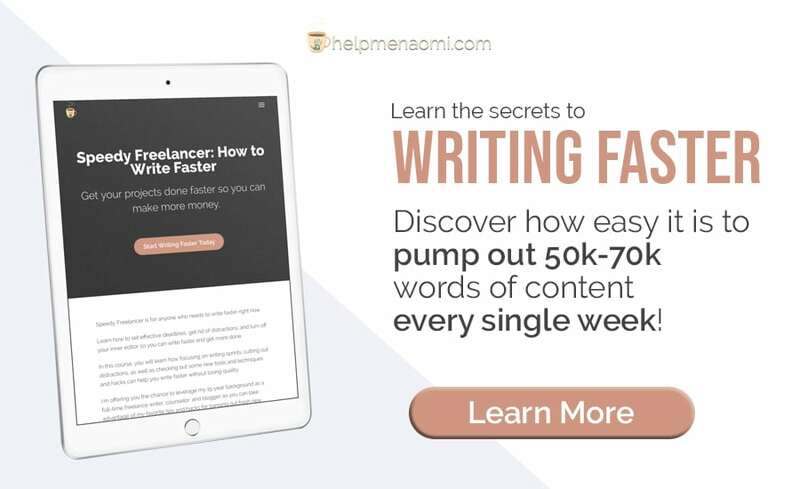 Revamp your content strategy, start posting more purposeful content mixed in with your fun content. Start attracting new members to your group using your funnel and attraction marketing. Slowly, the engagement will start to crawl back up. And the rest of the people, the ones who didn’t notice they were in there or were only in there for the giveaways, will either come around to the new group, or leave. And it’s okay if they leave, because you don’t want them in there anyway if they aren’t participating. 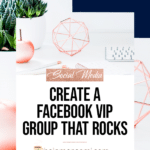 If you can manage to jar the relatively inactive people into leaving your group while simultaneously attracting new members to join, your engagement and reach will climb with very little extra effort on your part. What about Loops and Joining Ladders? Loops and Joining Ladders are filled with people who are only interested in growing their group to large numbers. The people in there don’t care about you, your group, your products, or your company. They are only interested in getting you to join their group. So once again, you will end up with a large group of people in your group who have no interest in being a part of your group. Remember that these people are your friends. They are your livelihood and they are all that stand between your success and your business going under for good. That’s important, far more important than any sale. And as such, it shouldn’t be rushed. Treat them as important as they are, and your group will thrive. Thanks for the tips. This is really well written article! Thank you so much for the compliment! I’m so glad you found it helpful!! Thank you, very good information. Can an invite be retracted? If you go into your group (on desktop) there should be a section for “invited members.” These are members who were added or invited to your group but have never joined or accepting the invitation. You can retract any mistaken invitations there.